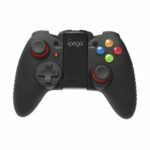 The IPEGA PG-9077 Gamepad is a wireless game controller which can be used in the different platforms such as Bluetooth-enabled smartphones and tablets. It also supports play computer games. Ergonomic design, let you enjoy long-playing gaming. High speed and reliable Bluetooth connection technology, fast and easy pairing via Bluetooth. 360 degree simulation button supply excellent control ability. 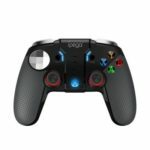 L2 and R2 button have simulator function, much more focus on operating details, make games controlled exactly. Built-in lithium battery, can be used around 10 hours continuously after fully charged. 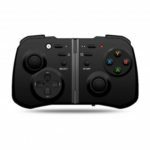 Support TURBO (acceleration) function,make it stronger and faster when playing games. 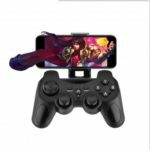 Widely compatible with smartphone, tablet, smart TV, STB and PC, let you play with all kinds of devices easily. 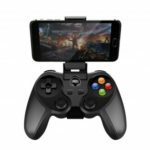 Come with an adjustable telescopic stand, fit for 4-6 inch mobile phones, convenient for playing games. Ergonomic design bring you extremely cool and comfortable hand hold feelings.